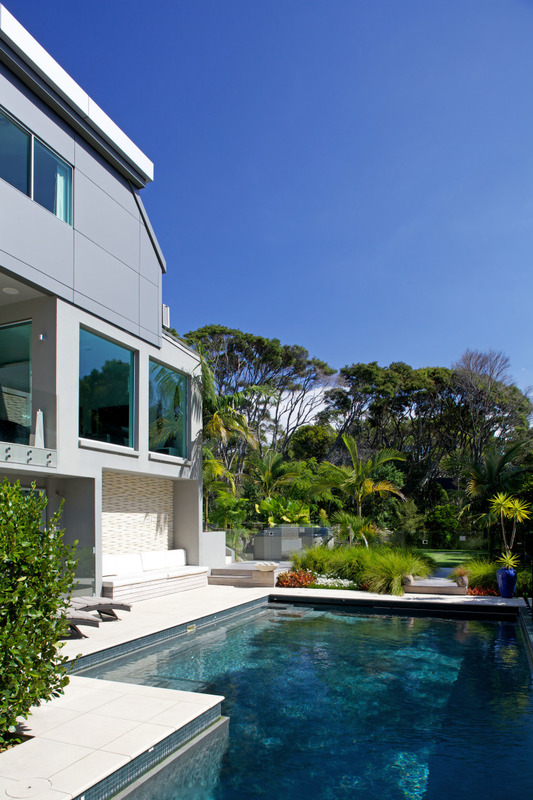 A swathe of green lawn surrounded by tall trees and interesting shrubs is part of the new landscape. A timber boardwalk connects this to the existing swimming pool. With the price of land soaring in our cities, it is a real luxury to be able to acquire extra land that's not for building, but to expand a beautiful landscape. That's exactly what the owners of this property did, when an adjacent site came on the market. 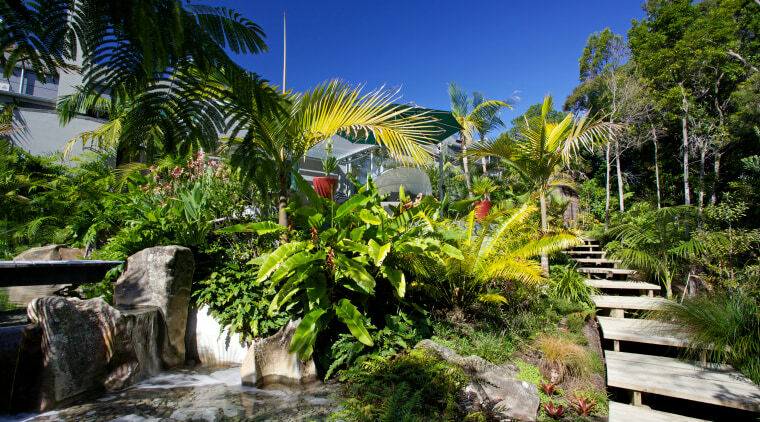 They took the opportunity to secure the land to create a tropical haven that would be a recreational garden for their growing family, complete with pathways, pools, bridges, waterfalls and a children's playground. 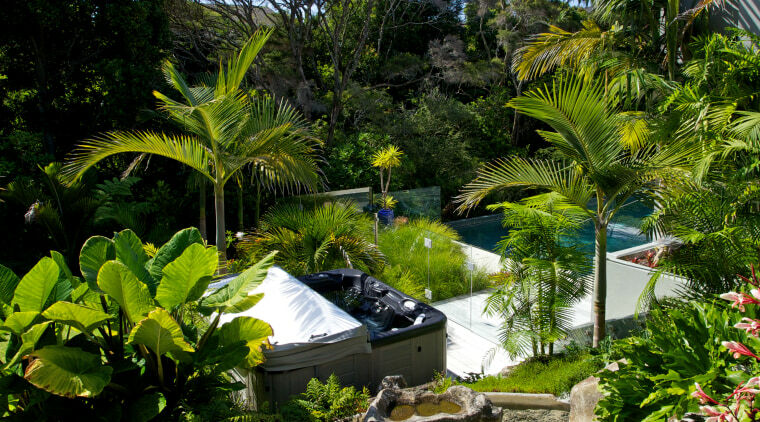 Natural Habitats landscape architect Mark Read says the company had earlier developed a multi-award winning landscape around the existing home, which included a swimming pool, spa and lush tropical planting. 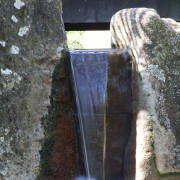 The existing spa pool was moved to provide a better outlook. It is now tucked amid the greenery. "The main challenge for this project was the need to reorientate the living room, so it could open out to the new landscape on the south side of the house," Read says. 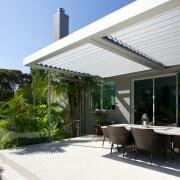 "We needed to create a wide opening with glazed sliding doors, and introduce a new sheltered podium-style patio with overhead louvres, which now looks over the new landscape." Another challenge was working out the best design response for a steep site. The solution was to step the patio to meet the lower ground level, and to introduce timber boardwalks and cantilevered steps down the hill. 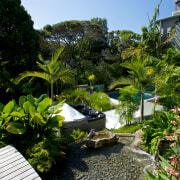 "One pathway leads down to a timber bridge across a pool one of two pools and two waterfalls in the garden," says Read. 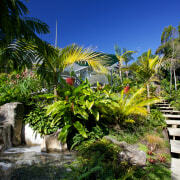 "These feature moss-covered natural rock formations set amid lush tropical planting. 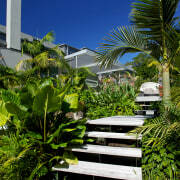 Essentially we set out to create a tropical rainforest garden, removing 60% of the existing acmena trees. 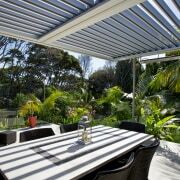 The rest were retained to shelter the landscape and to screen it from neighbouring properties." 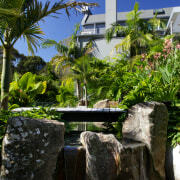 Designed by Mark Read, Natural Habitats, this garden is a lush tropical landscape in the city, with timber boardwalks and steps. 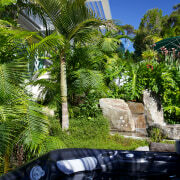 Key plants include a wide variety of palms, cycads and colourful and scented tropical shrubs, such as gardenia, frangipani, hibiscus, heliconia, ginger, philodendrons, orchids, bromeliads, and calathea. 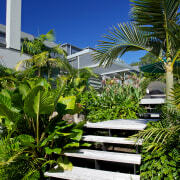 New Zealand native plants include karaka, nikau, tree ferns, pohutukawa, kohekohe and taraire. The garden paths extend right down to a circular lawn and a series of children's play equipment. This area also links back to the swimming pool. 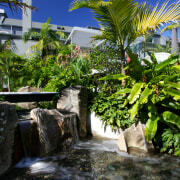 The existing spa pool was moved to better integrate with the new landscape bathers now overlook a waterfall.